Tall floor lamp in a skyscraper modernist style. 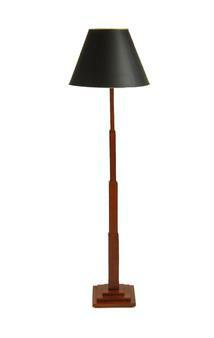 This stylish floor lamp has both a Frank Lloyd Wright feel and an Empire State Building "Deco" sensibility. Starting from a stepped base are seven "set back" architectural design details, each narrower to the top. A medium mahogany color over what appears to be birds eye maple. 63" tall with a 10"x 10" square base. Very stable and sturdy on a very heavy base. A shade is not included in this sale. Excellent condition.